Leigh is at the Natick Mall combining two of her favorite things, shopping and sushi! She stops in at Wasabi, one of the most unique sushi restaurants you’ll ever find! Wasabi Modern Japanese Cuisine is in the center of a busy part of Tyson’s Corner Mall. 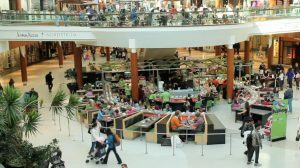 Because of that, there’s a lot of foot traffic around Wasabi – people carrying bags from Forever 21 or Barnes and Noble, looking curiously as they pass by or ride the escalators that are on either side of it. 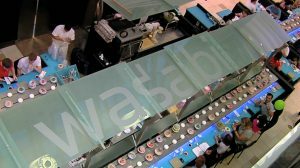 Fresh, fun and futuristic, Wasabi in the Natick Mall has busy shoppers feasting with their eyes before their bellies. 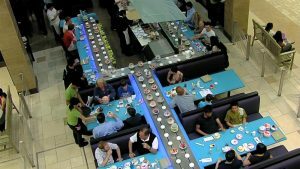 With tables lined around a snaking conveyor belt, fresher than fresh sushi weaves through an open dining room surrounded by stores and shops. It takes a while to make sense of what’s going on at the four-month-old Wasabi. Most of the standard restaurant conventions – ordering, pricing, courses, menus – have been turned upside-down in a space with no walls and few right angles. Snaking through the dining area, a divided stainless steel conveyor belt curves like a surreal bi-directional river. Along its banks, diners in plush booths are encouraged to grab brightly patterned plates of sushi that float along on 300 elevated white discs. If a unique eating experience is what you’d like, check out the new-age sushi restaurant Wasabi at the . Wasabi Modern Japanese Cuisine is a chain restaurant that hails from Washington D.C. The chain has two locations in D.C., one in Virginia, and now one in Natick.